PT/35(b) may very well have been necessary to “solve the case”, but it was certainly not sufficient. It was also necessary to match PT/35(b) to the MST-13 timers which had “solely” been supplied by MEBO to Libya. It turned out that the CIA was “fortunately” in possession of such a MST-13 timer (K1)which had been allegedly brought back to the US by some US Government employees following a visit to Togo in the fall of 1986. Without the Togo timer, PT/35(b) could not have been identified and therefore there would have been no case, let alone an indictment, against Megrahi and Fhimah. But it is the Senegal timer that made it possible to connect PT/35(b) to MEBO. What do we know about this Senegal Timer? The story of the Togo timer was weird and murky. But the story of the Senegal timer is out of a “serialized novel”. Can we trust this story? During the night of 19 to 20 February 1988, two Libyan citizens and one Senegalese man were arrested upon their arrival at Dakar airport, Senegal. An anonymous caller had warned the Authorities that the three men were carrying weapons and explosives in their luggage. The caller was right. Their luggage did indeed contain some TNT and SEMTEX-H explosives, a Beretta handgun with a silencer, a box of 25 bullets, a bunch of detonators and, last but not least, a boxed MST-13 timer. The following description of the event (Dakar Airport, 20 February 1988) is taken verbatim from the Police Report. When the passengers got off, we observed the presence of Ahmed Khalifa Niasse, known notoriously for his dealings with Libya. He was accompanied by two North African-looking individuals, who seemed bothered. Mr Niasse, having tried to go directly to the VIP lounge, was asked to follow the marked route. On their arrival in the immigration hall, these individuals were subjected to a body search and taken to the VIP lounge. 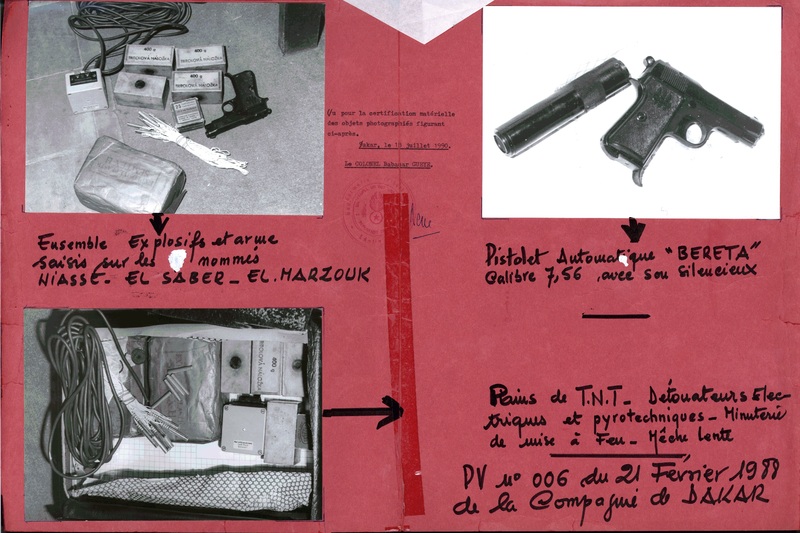 The small case in which the arsenal was located was carried by one of the individuals carrying a Senegalese passport in the name of Mamadou FALL. A body search led to the discovery of a Libyan passport in the name of El MARZOUK, Mohamed, born in 1952 in Tripoli and exercising the profession of farmer. The second individual named Mansour Omran SABER born in 1953 in Ben Ghashir ( Libya) exercising the profession of employee with no further details. This person had no entry visa to Senegal. NOTE. It is noted that the only pistol found was a Beretta 7.56 mm caliber. The clip which went with the gun was empty of any bullet. This arm, fitted with a silencer, had no compatible ammunition. In the same briefcase, a packet of 25 bullets 9 mm was found. These bullets did not have a compatible arm either. The other suitcases only contained ordinary clothing and toiletries. At the end of the searches their personal luggage was given back to them. On 18/07/1990, DI William Williamson interviewed Babacar Gaye, a Senegalese “Colonel de Gendarmerie”, regarding the arrests made at Dakar Airport on the 20th February 1988. Colonel Gaye confirmed that two Libyan nationals (El saber and El Marzouk) as well as a Senegalese person (Niasse) were arrested on that night. President Diouf could not be any clearer than that. Their arrest was a sting operation. But what was its purpose? Arresting the two Libyans was certainly not the goal in itself. They were released without trial and returned to Libya. The cable wired on 14/03/1988 is extremely important to understand the Lockerbie Affair. The full cable is archived on this page. RE TIMING DEVICE: TIMING DEVICE IS MANUFACTURED TO ACT AS AN ELECTRONIC TIME DELAY FOR THE DETONATION OF EXPLOSIVES. THE DEVICE IS WELL ENGINEERED, SOPHISTICATED, WATER-RESISTANT, AND IS SELF CONTAINED COMPLETE WITH POWER SUPPLY. PHOTO N° 3: TOP VIEW OF DEVICE SHOWING UNIQUE STEREO WIRE CONNECTOR; SAME CONNECTOR WAS FOUND IN LIBYAN-ATTRIBUTED RADIO CONTROL FIRING DEVICE RECOVERED IN NJAMENA, CHAD SEPTEMBER 1984. ALLOWS FOR QUICK CONNECTION OF DETONATOR WIRES TO TIMER UPON DEPLOYMENT OF DEVICE. The Senegal Timer: Zeist Judges Dead Wrong. Again.